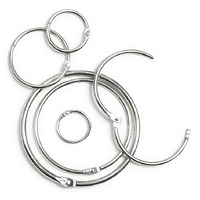 Loose Leaf Rings are nickel-plated and feature a snapping end piece that can be snapped shut and opened for easy editing of swatch books, bulky loose-leaf materials, samples, etc. Also referred to as "Book Rings", we feature sizes from 3⁄4" through 3". Samples are available upon request.